That laughter you heard last night was the sound of the funniest people in show business all in one room. At the first annual Comedy Awards held at the Hammerstein Ballroom in New York City, Comedy Central gave its highest honors to David Letterman, Eddie Murphy, and Tina Fey. And to rising star Zach Galifianakis, whose name doesn't fit in a headline. Sorry, Zach. Letterman received the Johnny Carson award for comedic excellence, a testament to his long career. 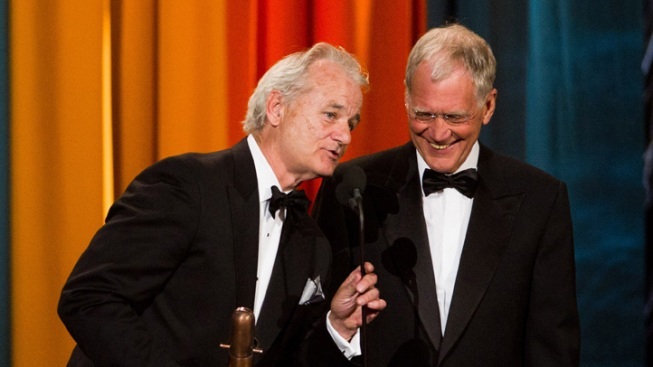 Legendary comedian Bill Murray presented the long-time king of late night with the award. Eddie Murphy also receeived a lifetime achievement award of sorts, taking the Comedy Icon prize. Tina Fey and Zach Galifianakis received best actress and actor in a movie, while the buddy cop spoof "The Other Guys," featuring Will Ferrell and Mark Wahlberg, took best movie. The award for best television comedy went to Modern Family while 30 Rock's Alec Baldwin and SNL's Kristen Wiig were named best television actor and actress. Comedy Central honored a few of their own as well: South Park, consistently funny since 1997, took best animated series while "The Daily Show With Jon Stewart" won for late-night comedy series. The Examiner reported that the show, unsurprisingly, was full of funny moments. It will air at 9 PM, Sunday April 10, on Comedy Central.